PageMutant Help - How do I add my logo or favicon? How do I add my logo or favicon? You can add your logo in the Settings in the side navigation. Enter the image URL. 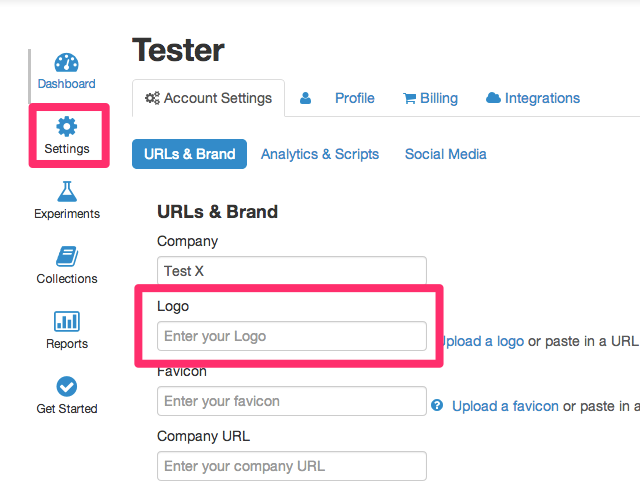 You can use a logo that you host or Upload the logo by going to Collections > Uploads. You may have a particular theme that works best with your logo as part of the header image instead. To have it not display a logo on any of your pages just enter "None" in the logo field. In the next field you can enter the favicon, which is the icon that is displayed on a browser tab. If you need to find your icon, just view the source of your website. It is commonly a line with rel="shortcut icon" and you just need the href part. For example href="YOUR ICON." You just need the part in the quotes. Send us a note if you need help locating your favicon. It is not a critical piece of a landing page but it is another opportunity to keep your branding consistent.